It is commonly stated history is written by the victor and the American Revolution is no exception. As a result of the rebel triumph in the War for Independence, loyalists historically have been placed in a negative light. 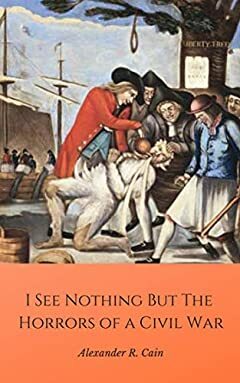 In countless works and popular culture, loyalists have been portrayed as inept people whose blind faith to the English crown led to their downfall. Unfortunately, such an erroneous stereotype only trivializes the struggles of the American loyalist. In 2014, Author Alexander Cain released the first edition of "I See Nothing But the Horrors of a Civil War." Now, five years later, this acclaimed book has been rewritten to reflect the recent discovery of countless new historical documents, town records and historical artifacts. This is the story of the men, women and children from New York and New England who chose to remain faithful to the Crown and fought as part of McAlpin’s Corps of American Volunteers during the Saratoga Campaign of 1777. For the first time, Cain carefully outlines the political, social, religious and economic motivations to remain faithful to the Crown. I See Nothing But the Horrors of a Civil War also reconstructs the role of the American loyalist who served with McAlpin’s Corps of American Volunteers during the Burgoyne Invasion. Finally, the role of loyalist refugees is brought to light. Cain carefully recounts the daily struggles of female loyalists, as well as the hardships experienced by exiled loyalists who were forcibly confined to Canadian refugee camps.